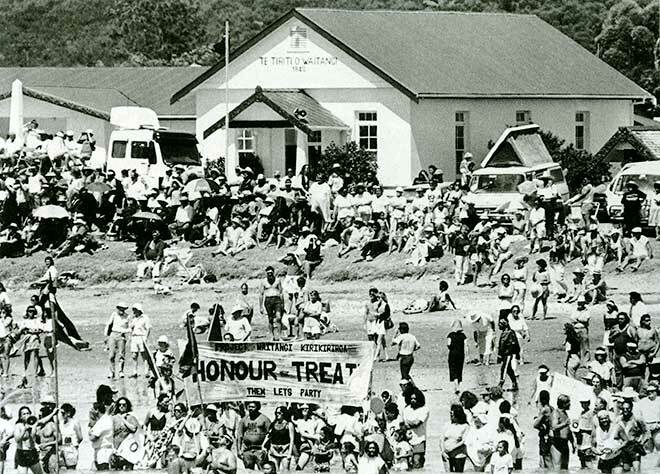 Since the 1970s Waitangi Day celebrations have often been attended by protesters who want to draw attention to breaches of the Treaty of Waitangi by the Crown. This photograph from 6 February 1990 shows protesters at Te Tii marae, Waitangi, wading into the water with their banner so the official party approaching by launch can read it more clearly. That's our banner! Project Waitangi was a Pakeha Treaty education group. We were only a small group and we travelled by minivan up from Hamilton (Kirikiriroa) for the day.